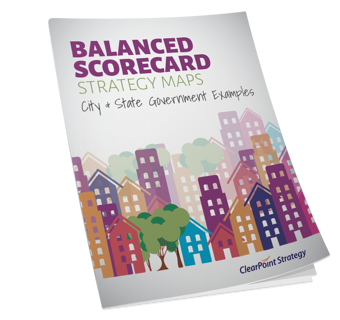 Clearly communicate your government’s strategic plan with the help of the Balanced Scorecard. Successful strategy maps come in a number of shapes, styles, structures, and complexities. The one unifying goal is to make a communication tool that engages the entire team and community behind a shared plan of action to achieve the mission at hand. Four sample Balanced Scorecard strategy maps, from city and municipal governments to police and security organizations. How each of these organizations can experience success from their strategy map. What conclusions you can draw from strategy mapping (and why you should create your own). Download these sample government strategy maps today.